Review: "Gioggi, Riccardo: A Theory of Dynamics" - Sea of Tranquility - The Web Destination for Progressive Music! 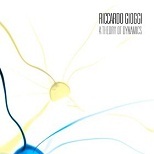 A Theory of Dynamics is the debut release from Italian guitar master Riccardo Gioggi. It's available on Digital Nations Entertainment, a digital only label and a subsidiary of Favored Nations Entertainment; the label founded in 1999 by guitar legend Steve Vai. Normally I'm not a huge fan of instrumental music (give me great vocal harmonies any day). But I must say; I was thoroughly impressed with this release. Calling Gioggi a "guitar master" is actually an understatement. This is not just someone thrashing through riff after riff with lightning speed; Gioggi is incredibly tasteful with each note. The first track I listened to was actually on You Tube called "The Spy Song". One listen will tell you there is a great deal of talent here. Riccardo Gioggi along with Simone Del Pivo (drums) and Marco Mastrobuono (bass) take you on a musical journey incorporating jazz, metal and progressive rock expertly. I also noticed the You Tube suggested videos on the right included Paul Gilbert, Nuno Bettencourt, Carlos Santana, Steve Vai and Steve Hackett; Riccardo fits in comfortably with each of these guitar heroes. Back to the other tracks: If you are looking for some great heavy riffs try "Time Rush", "Dreamt 11" or the title track "A Theory of Dynamics", or try "Designs" where Riccardo just manhandles the Wah-wah pedal. For a bit of a mellow approach you will not be let down with "Air" which features Michael Manring on Bass and Hyper Bass. "Even Tide" has an enjoyable country feel to it. "Every Single Step" has a wonderful haunting cello played throughout by Francesco Parente and also features background voices that would make every parent smile. In a recent interview Riccardo Gioggi stated, "My goal is to create beautiful music the best that I can, and then play it at a high performance". With this release he most definitely has. A Theory of Dynamics should be on everyone's must have list- give it a try you will not be disappointed.